To receive Rootdig.com updates via email use our subscription page. Follow instructions–including replying to the initial email you’ll be sent– or you’ll miss out! Email me at mjnrootdig@gmail.com if you have email subscription management issues. You are showing up as on the list. Thanks! You are on the list. Please let me know if you do not receive the postings. You are on the list. Please let me know if you are not getting the emails. You should be on the list. Thanks. 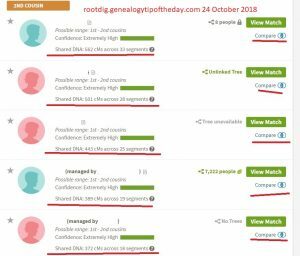 Great information from Rootdig. Thanks for email. Not to the best of my knowledge as I don’t think his family is from the Ufkes who settled in Hancock County, Illinois–which is where mine settled. Thank you very much for all your posts!!! I am having a problem unsubscribing from your lists. You have been unsubbed from this one. You will see that I ‘unsubscribed’ just wanting to let you know I’m only CHANGING email addresses so I ‘subscribed’ as [removed by administrator to reduce spam] Thanks for all the great posts! You are very welcome…and thanks for reading! I only want to receive the weekly blog as I just don’t have time to access everything on a daily basis. the weekly one……………………..correct? I would hate to lose this valuable resource. I really appreciate receiving the interesting articles you post. Like others weekly is all l can manage these days. there is enough general advice for me to learn so please keep sending to me. I have recently discovered that some of the English ancestors went to USA and others to Australia. So some of your articles could be even more value in the future. Thankyou. You are welcome. Good luck in your research. Micheal, I’m wanting to subscribe only to your weekly blog because I can’t keep up with your many valuable posts. (I don’t know how one person can “output” all the material you produce from “daily tips” to weekly blogs, and everything between.) . What a wealth of knowledge I’ve learned from you including your webinars. I will now go to an unsubscribe screen and try to unsubscribe from everything except the weekly blog. If I get “stumped”, I’ll email you. Thank you for all you’ve done and continue to do for your followers — beginners to advance genealogists!! There’s more information on it here. This is a terrific website!!!!!!!!!!!!!!! Thank you soooooooooo much!!! Thanks for your comments. You are welcome! I keep getting the notices I need to re-subscribe and reply to the e-mail. When I try submit the re-subscribe section I get a notice that I have already done it. But never get an e-mail. Just sent you an email, Sharon. Please keep me subscribed. Thank you. It keeps saying welcome back and my gmail account….which I never use! I put in the charter email that I do use, and then it says it can’t find my subscription. Judy-are you getting the messages? I’ve just started subscribing to your tips and really enjoy them! Please keep m subscribed! Please keep me subscribed. Whenever you have given a program within a 2 hr drive from my location I have tryed my best to attend, have enjoyed your classes given in the past at the college, you hve amazing knowledge which you pass on in a most enjoyable manner. Thank you for all the help you are to everyone. Thanks for your kind words Carol. I really appreciate it. If you are not receiving the messages–please let me know. Please keep me subscribed. Thanks for all your work! You are on the list. Please let me know if you do not receive postings. You are on the list. Please let me know if you do not receive messages. You are on the list.Please let me know if you are not receiving the messages. Please keep me subscribed. Thanks. You are on the list.Please let me know if you aren’t getting messages. Thanks! Keep me on your list please and thank you.